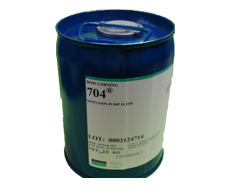 Specialty Fluids offers drop in replacements for DC-702, DC-704, and DC-705. All MT silicone fluids meet or exceed the specifications of the Dow Corning products. MT-704 can be used anywhere DC-704 is recommended. Please call us at (844) 322-9500.